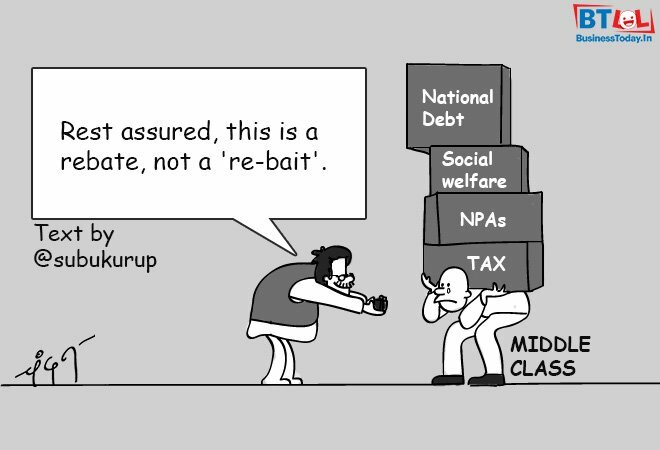 Chandan is sceptical of Finance Minister Piyush Goyal’s tax ‘rebate’ plan as the Modi government burdens the middle class with welfare schemes in a re-election bid. 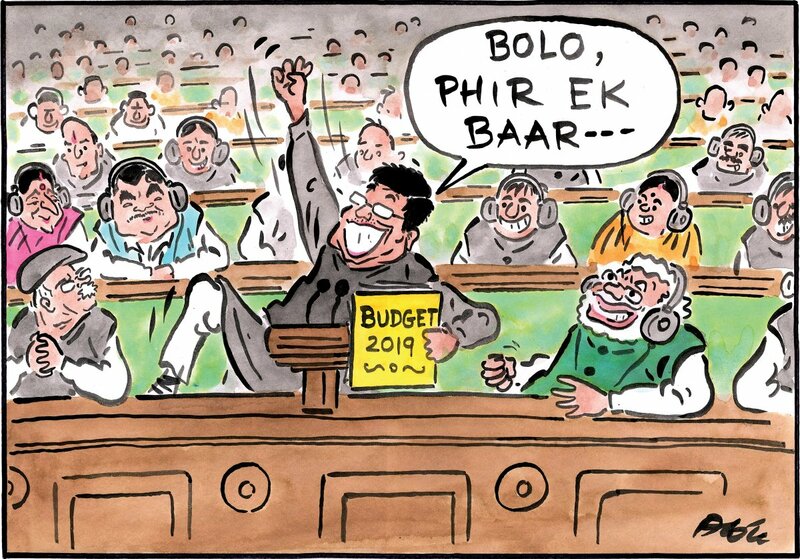 Highlighting BJP members’ chant of ‘Modi, Modi’ in Lok Sabha after Finance Minister Piyush Goyal announced the income tax proposals, Alok suggests that budget 2019 was just a re-election bid. 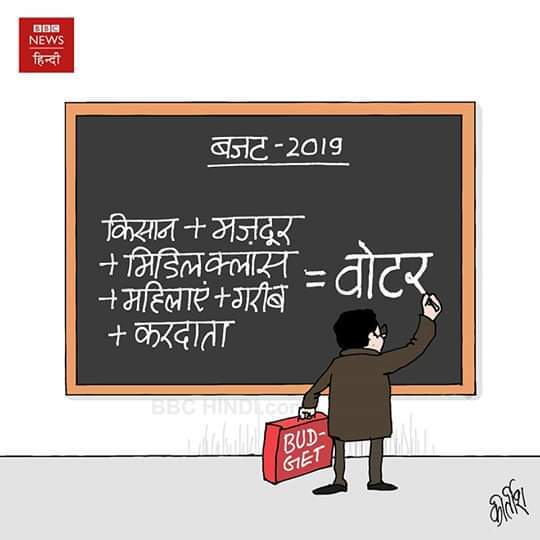 Kirtish Bhatt says the Union budget’s focus was on all possible vote bases, with specific schemes designed for farmers, labourers, middle class, women, poor and taxpayers. 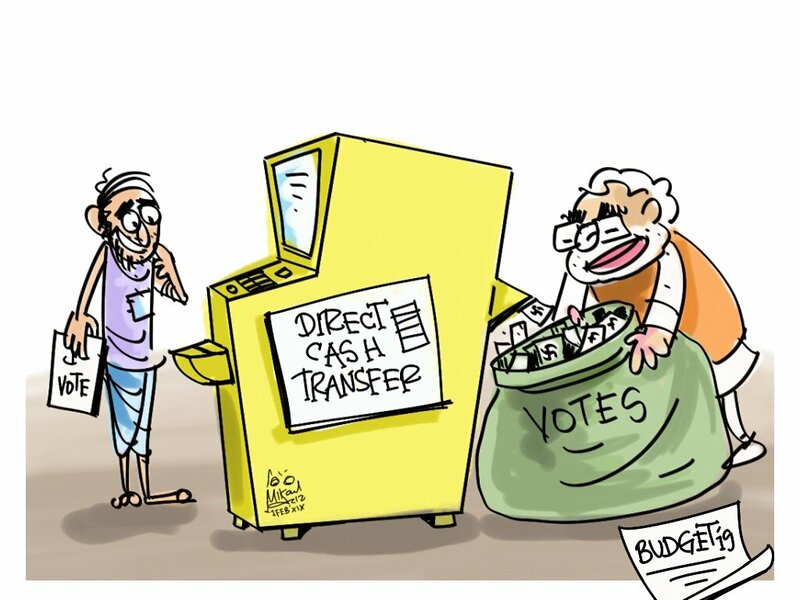 Mika Aziz illustrates the direct cash transfer scheme of Rs 6,000 per annum to farmers owning less than 2 hectares of land as a clever move by the Modi government looking to turn the proposal to its own advantage in the election year. 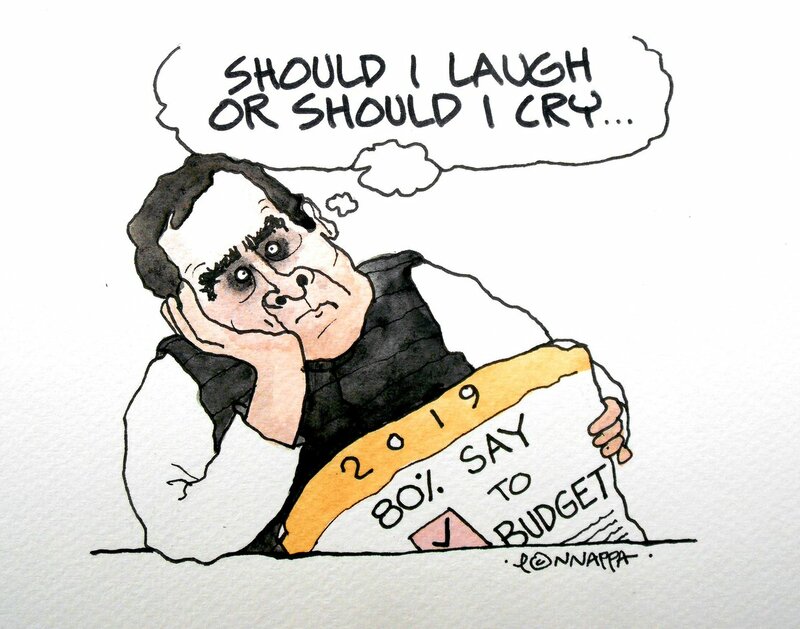 Nala Ponnappa draws a worried Congress president Rahul Gandhi who made the first move with an announcement of minimum income guarantee for the poor — a plan the BJP government ran away with in its budget Friday. 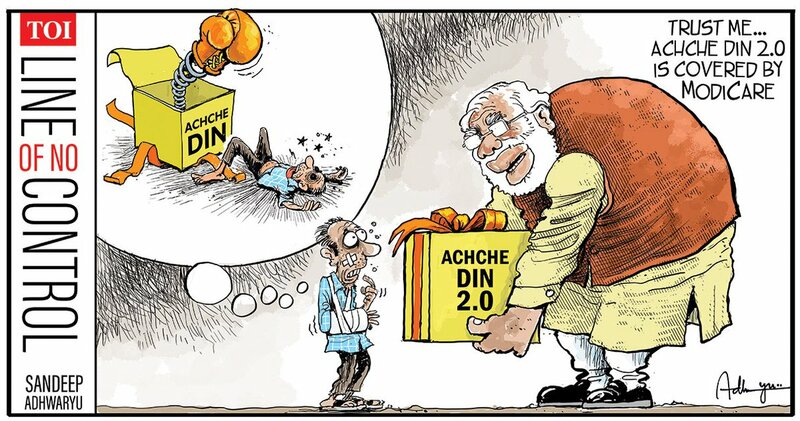 Sandeep Adhwaryu weighs in on a new version of Prime Minister Narendra Modi’s promise of ‘Achche Din’ (better days) to the ‘bruised’ common man. 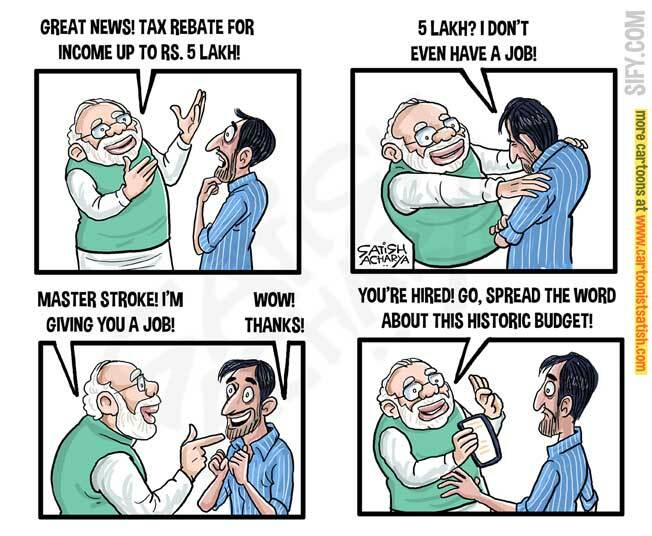 Satish Acharya takes a dig at the tax rebate plan for people earning up to Rs 5 lakh a year as he takes aim at the Modi government for failing to create jobs.